Remote sensing technology plays a vital role in the initial stages of ore mineral exploration. Increasing demands for minerals by society due to the exponential growth in population and industrialization emphasize the need for replenishing depleting reserves by locating new prospective ore deposits. 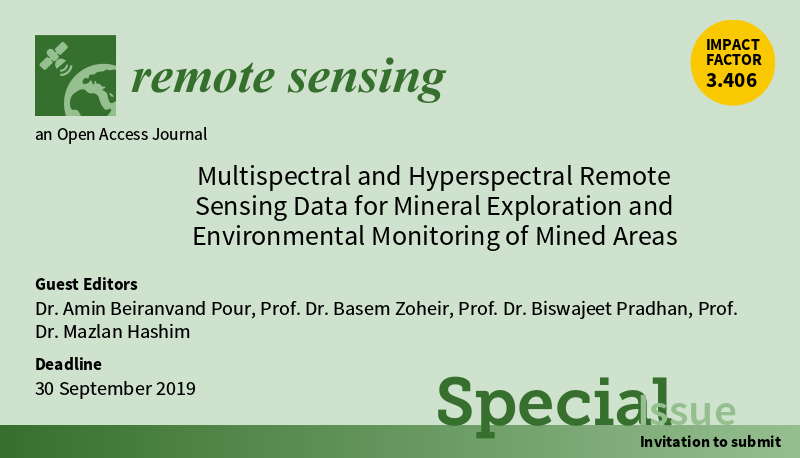 In recent decades, hydrothermal alteration mineral detection has become one of the most conspicuous applications of multispectral and hyperspectral remote sensing satellite data for ore mineral exploration. Numerous ore deposits such as orogenic gold, porphyry copper, massive sulfide, epithermal gold, podiform chromite, uranium, magnetite and iron oxide copper-gold (IOCG) deposits have been successfully prospected and discovered using remote sensing satellite imagery in the metallogenic provinces and frontier areas around the world. The Advanced Spaceborne Thermal Emission and Reflection Radiometer (ASTER), Landsat data series, the Advanced Land Imager (ALI), Worldview-3, Hyperion, HyMap and the Airborne Visible/IR Image Spectrometer (AVIRIS) multispectral and hyperspectral data support cost-effective techniques for ore mineral exploration around the world. Advanced image processing algorithms based on state-of-the-art data extraction techniques can be implemented for detecting key alteration minerals associated with a variety of ore deposits. Analytical spectral device (ASD) spectroscopy and X-ray diffraction (XRD) analysis in conjunction with remote sensing data can provide comprehensive information about the alteration zones and mineral assemblages associated with ore mineralizations. Synthetic Aperture Radar (SAR) data contain a high potential for structural analysis and mapping in metallogenic provinces. On the other hand, human-induced change in the form of mine excavation, mine tailing, mine waste and acid runoff requires particular monitoring by remote sensing satellite data. Environmental pollution mapping and monitoring of mined areas are the main challenges that need to be addressed for future sustainability and environmental management in metallogenic provinces. Submitted manuscripts should not have been published previously, nor be under consideration for publication elsewhere (except conference proceedings papers). All manuscripts are thoroughly refereed through a single-blind peer-review process. A guide for authors and other relevant information for submission of manuscripts is available on the Instructions for Authors page. Remote Sensing is an international peer-reviewed open access bimonthly journal published by MDPI.